A conscious coupling of ginger orange marmalade and peanut butter combine to create a superb balance of yin and yang. 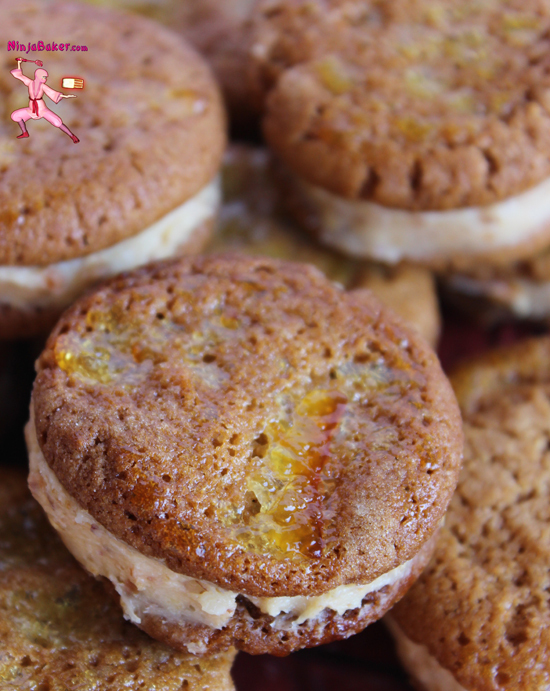 The cookie is filled with a Neufchâtel cheese kissed with more ginger orange marmalade and Fuji apple crumbles. Bake your favorite peanut butter cookie recipe into thin crisps coated with ginger orange marmalade and sugar. OR drop refrigerated peanut butter cookie dough in rounded teaspoons onto parchment lined cookie sheets. Flatten the cookies with a shot glass (or other small round-bottomed glass) dipped into ginger orange marmalade. Sprinkle with sugar. Bake at 350 degrees for 10 to 12 minutes. Cool. *Ninja Note: Freeze your peanut butter cookie rounds for 15 minutes or more. You can avoid cookies spreading and colliding into each other while baking. Whip up the Neufchâtel cheese with 1 tablespoon of ginger orange marmalade with an electric mixer. Gradually beat in the apples and powdered sugar. Add 1 tablespoon of milk (or more) to achieve an ideal consistency for the filling. Slather the filling onto a cooled cookie. Top with another cookie to create a peanut butter cookie sandwich. Serve with Reese's Pieces (peanut butter candies) if desired.